This week's Top Ten Tuesday focuses on books that I can't believe I haven't read. As an English major and Reading Specialist, I have read a lot of classics, but somehow I have never read these ten classics. I hope to read most of them one day and I am thinking of starting with One Hundred Years of Solitude and Rebecca. What do you guys think? 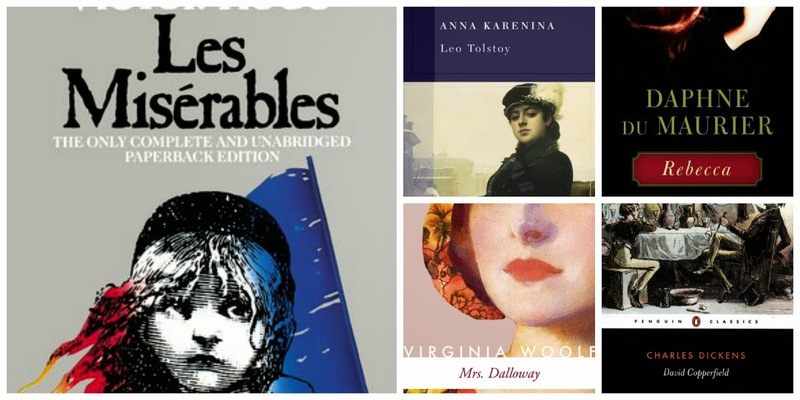 Have you read any of these classics? What classic novels do you hope to read one day? Let me know what you think. This meme is hosted by The Broke and the Bookish. I have heard great things about Dorian Gray. Hopefully I can check it out soon. Thanks for the recommendation and for visiting, Emma. I haven't read any of these books but I do hope you enjoy it. Thanks, Christine, and thanks for visiting! Good list! I highly recommend Rebecca. It is one I have reread over the years. Dracula is an interesting read, told in letters and newspaper articles. I included Les Miserables as well. My Dickens I can't believe I haven't read is Great Expectations, but since I read and loved Bleak House, I think I have hit my Dickens quota. Thanks for sharing. I am dying to read Rebecca! Thanks for the recommendation. I love Great Expectations, Nicholas Nickleby and A Christmas Carol, but I haven't checked out his other works. Thanks for visiting! I started 1984 about a month ago, but I had to set it aside. The writing's a bit heavy on the narrative for me. That's what I hear, although my husband loved it. I am not so sure about it. Thanks for visiting, Joy! I have read 1984, Dracula (years ago), Rebecca (quite a while ago - I want to re-read) and a couple pages of Anna Karenina when I was a teen. Maybe I should try to read that one at some point. It's a huge book. My fave classic is Wuthering Heights. I have been intimidated by Anna Karenina's size and I think that's why I avoided it. I should maybe try it in the future. I really want to read Rebecca! I love Wuthering Heights too…so good! Thanks for visiting, Leanna! I've started 1984 once but I just couldn't get into it... Maybe I should give it another go sometime. If my list was for the classics genre I would have definitely put Les Mis there too as well as Dracula. Funnily enough, I went to the library today and picked up The Picture of Dorian Gray so I'm really looking forward to that :3 A great list you have here! I hear that it's tough to get into, which is probably why I avoided it. Let me know what you think of Dorian Gray. I hope to read it sometime! Thanks for visiting, Nattie! One Hundred Years of Solitude is also on my to-read list! I think I'm going to start it soon. Anna Karenina is like my white whale - I've started it so many times but then lost steam and never finished. Maybe one of these days! I read his other book, Love in the Time of Cholera, and enjoyed it, so hopefully I can read Solitude. sooner than later. Thanks for visiting, Allison and I hope you find time to read it as well! I haven't read a lot of classics but I really want to read Les Mis. Me too, Megan! I love the broadway show so much, but haven't gotten around to the book. Thanks for visiting. REBECCA is lovely. I recommend it. Very gothic. I hear it's fantastic. I plan on reading it sooner than later. Thanks for the recommendation and for visiting, Kay! One Hundred Years of Solitude is so amazing. I wish my Spanish was up to speed and I didn't have to read the translated version! Thanks for the recommendation! I will definitely move them up on my TBR list. I read Love in the Time of Cholera, so I am sure I would appreciate One Hundred Years of Solitude. He's a fantastic writer. Thanks for visiting! Oh, I really loved One Hundred Years of Solitude; read a lot of his stuff in Spanish during grad school, which was certainly a challenge but lovely in the native language. I also love Anna Karenina; I read it for a second time about two years ago and it was awesome. Thanks for sharing these! Wow- in Spanish?! Impressive, Tara! I read Love int he TIme of Cholera and enjoyed it, so I should really get around to Solitude. You read Anna two times?! The size alone makes me nervous, but I hear it's great. Did you see the movie with Keira Knightly? I was intrigued by it, but wanted to read the book first. Thanks for the recommendations and for visiting! I was supposed to read One Hindred Years of Solitude for a book group years ago but I couldn't get into it. Some people really love it but I struggled with it. I hope you enjoy it more than I did. He is a major writer and I may try one of his other works someday. I have read Les Miserables and David Copperfield. I think I read Anna Karenina in high school. I loved the film version of Rebecca. I bet the book will be good. I liked Love in the TIme of Cholera, so I am hoping that I would like Solitude. I would love to see the film version of Rebecca after I read the book…I definitely want to read it sooner than later. Thanks for visiting, Christina! It's hard to make time for all of the classics! There are so many good books. Thanks for visiting, Elizabeth! Nice list! I've read 6 out of your 10 listed here, with varying degrees of success. I've also *tried* reading 100 Years of Solitude more than once and never got more than a few dozen pages into it. So many people I know claim that it's one of their favorite books, but I was never able to crack that one. Wow- 6 out of 10 is pretty good! I'm sorry you couldn't get into Solitude. I am hoping to one day since I really appreciated Love in the Time of Cholera. We shall see! I may feel the same way as you. Thanks for visiting! I have heard some mixed reviews for it, but I think if dystopians are your thing, then you will appreciate it. Thanks for visiting, Frannie! LOL! So with you. What most people don't get is that English majors quickly learn how to talk expertly about books they've never read (how could we possibly read all those books, write all those papers, work--well, I did anyway--eat, and sleep?). Of these, I have read 1984, Mrs. Dalloway, and Brave New World. Of those, BNW is my favorite. It's truly awesome. Great list. Haha. You are so right!?! I will have to check out Brave New World. I know my husband liked it and somehow I never picked it up. Thanks for visiting, Natalie, and thanks for the recommendation. I've only read One Hundred Years of Solitude off of your list and I have to say it wasn't a favorite of mine. I didn't really care for it at all. But that could just be me. It probably is as it seems to be a really popular classic. 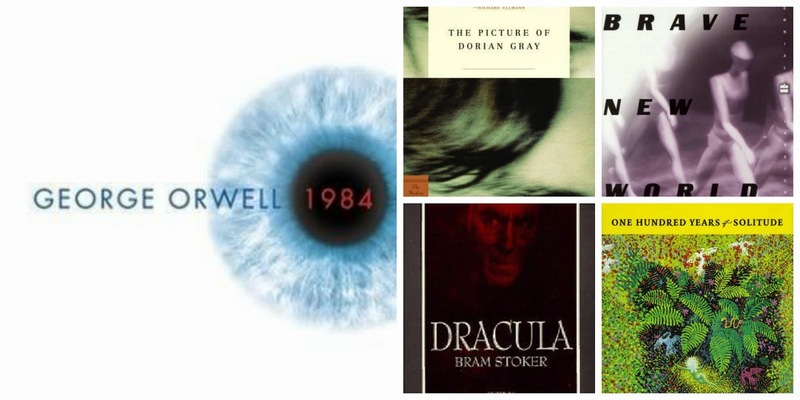 Though I haven't read any of the the others on your list, 1984 did make mine primarily because everyone and their brother keeps recommending it to me. I'll get around to it...someday. I've read a few mixed reviews for Solitude…some people either really love it or hate it. You are not alone in the fact that you didn't find it enjoyable! I'm glad I am not the only one who hasn't read 1984. I feel like everyone raves about it. Hopefully I can, like you, check it out someday soon. Thanks for visiting, Ash! I read 1-5 and 7. I didn,t like 100 Years but liked the rest.